Inspired by Jeremy Deller's 'Procession' for the Manchester International Festival in 2009, we bring you this EXCLUSIVE limited edition t-shirt. 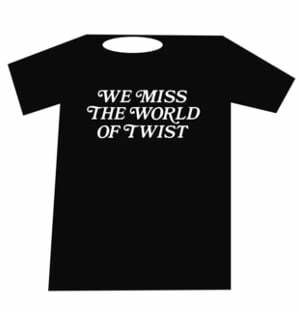 The 'We Miss The World Of Twist" t-shirt is a tag-less crew neck t-shirt made from 100% organic, 150gsm, soft combed cotton. Fabric: 100% comfort soft combed, 150gsm, OE-certified organic cotton. Men’s - small (34” chest), medium (36” chest), large (40”/42” chest) and extra large (44” chest).